Furniture joinery might seem like it requires years of practice and great attention to detail. Eberhard Eichner, lead designer and builder in The RE Store’s REvision Division, begs to differ. 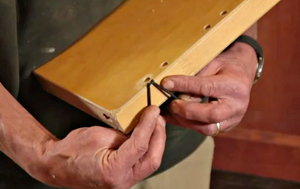 The 30-year veteran of finish carpentry, furniture making and repair has figured out a way to quickly create strong joints when building furniture. Using his “butterfly technique” he quickly fastens items like salvaged cabinet doors, used hollow core doors, reclaimed trim and scrap lumber to create beautiful, strong and functional furniture and home decor items. Watch the video to see the ease of the butterfly technique. Visit the The RE Store’s REvision Division gallery inside our store to see the latest furniture creations. Each day is a new treasure hunt of the latest salvaged and reclaimed one-of-a-kind items.